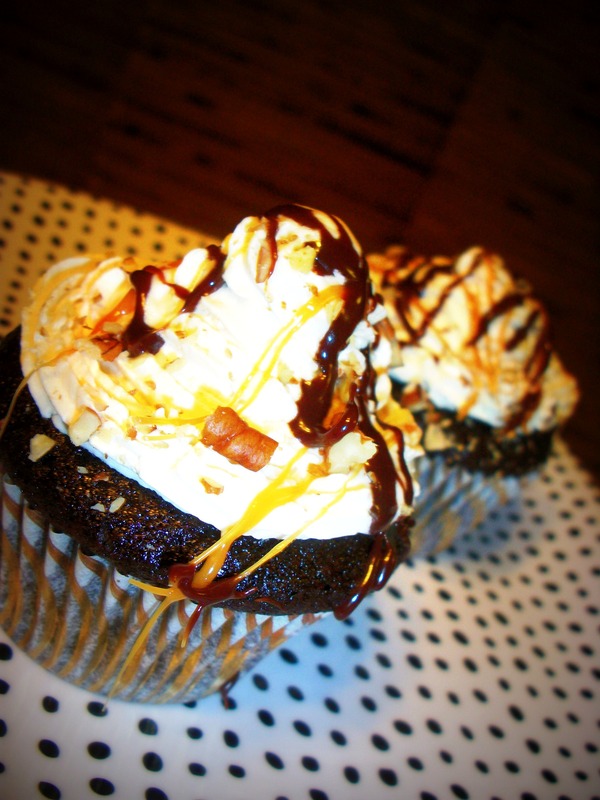 Make that a rich, chocolate cupcake with caramel pecan filling, topped with silky caramel buttercream and drizzled with caramel and chocolate, sprinkled with even more pecans. Uhhh, yeah. If that doesn’t say “I love you”, I don’t know what does. In all honesty though, I made these cupcakes for a friend’s birthday last week, but they would have made a grrreat Valentine’s Day treat. Actually, they’d make a great treat for any day so I thought I’d share. 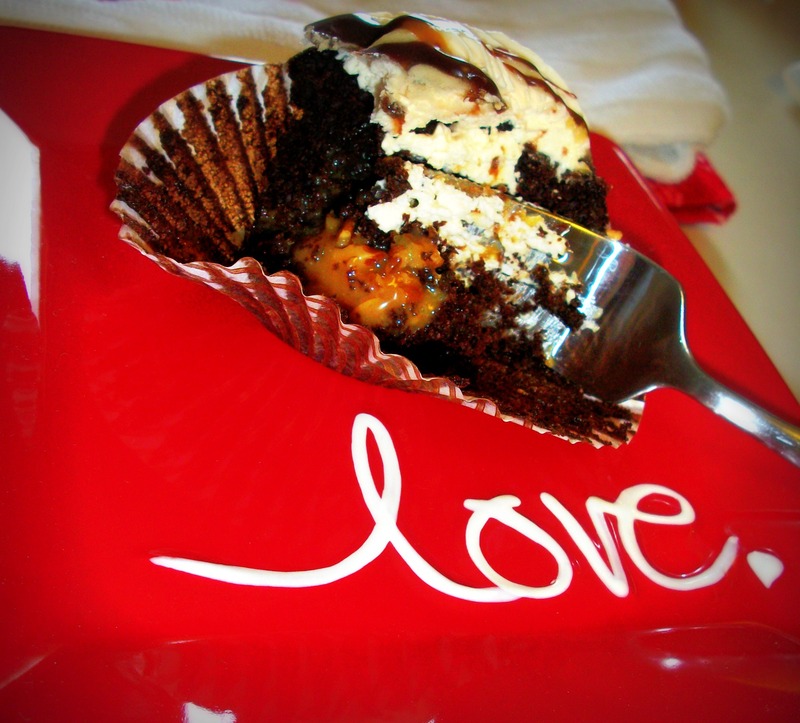 I started with my favorite one-bowl chocolate cupcake recipe from Miss Martha Stewart. The only substitution I make to this recipe is swapping safflower oil for olive oil. I’ve never purchased safflower oil, nor have I ever seen it (not that I’ve been looking). It’s only 3 tablespoons so I’ve always figured it wouldn’t make too much of a difference. These cupcakes are absolutely delicious regardless. Once the cupcakes were baked and cooled, I hollowed out a little pocket for caramel flling in each one. I also do not have one of those fancy schmancy cupcake hollow-outers (technical term, of course) so I just use one of my large frosting tips, flipped upside down and twist it into the center of the cupcake. It doesn’t save the middle of the cupcake quite like one of those hollow-outers, but it works okay. I saved all of the centers and the crumbs in a little container, filled the holes with melted caramel and pecans, and then plopped the tops back on the caramel-filled holes. 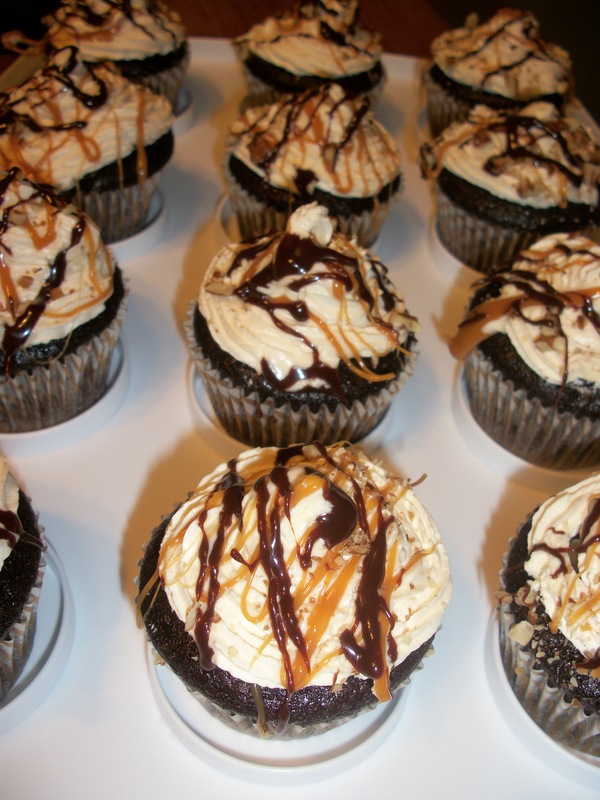 Next, I mixed up a silky, caramel buttercream frosting and swirled it on top of these delicious treats and topped them off with drizzled caramel and chocolate and sprinkled them with crushed pecans. 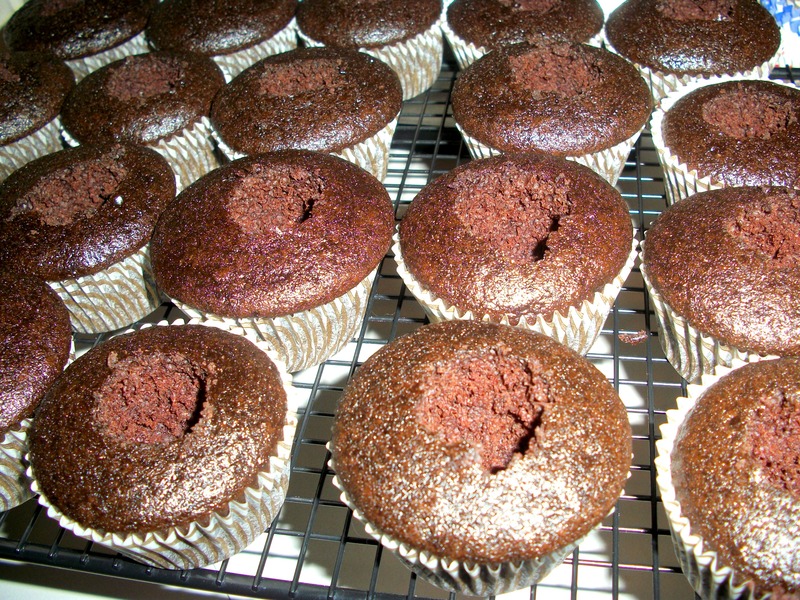 Martha Stewart One-Bowl Chocolate Cupcake–remember, olive oil (or probably any kind of oil) works just fine. -Throw it all in a pan over low heat, stir for 7-8 minutes or until smooth. -Stir together sugar and water in small saucepan over medium heat. Bring to a boil. Continue cooking (do not stir!) until mixture turns dark amber in color, 7ish minutes. Be careful, it can burn pretty easily. -Remove from heat. Slowly add cream and vanilla, stirring until completely smooth. -Set aside until cool to the touch. -Beat the butter until light and fluffy. Reduce speed to low, add powdered sugar, and mix until fully incorporated. -Turn off the mixer and add caramel. 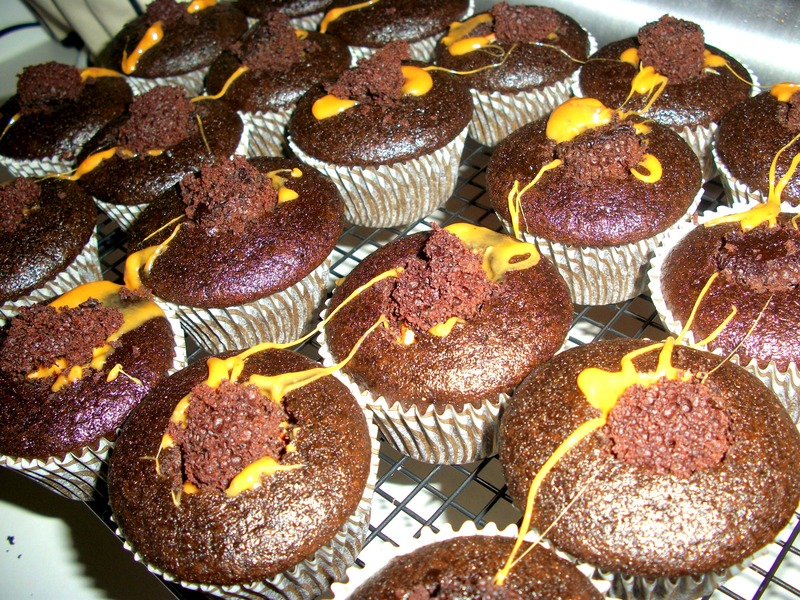 -Beat frosting on low to incorporate caramel, then increase to medium-high heat until frosting is light and fluffy. How you choose to garnish these is obviously up to you, but I just melted some caramel and chocolate and did some drizzling. Pour yourself a huge glass of milk and enjoy! 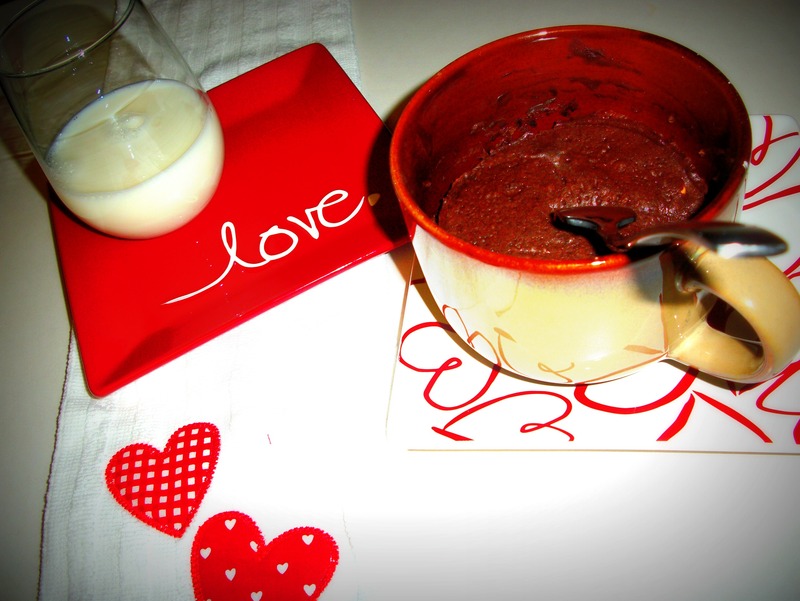 Speaking of chocolate cake and milk…I finally made mug cake tonight! I’ve seen a zillion recipes for this stuff and decided that tonight was the night I would make it myself. I read through tons of recipes but made a version of this one. Mix it all up in a coffee mug, throw it in the microwave for 3 minutes, and there you have it! The hubby and I celebrated 12 years today. 12 years since he asked me to be his girlfriend. That’s right, our anniversary is Valentine’s Day. How cliche, huh? Thankfully, he made me his wife in July so we have a new anniversary to celebrate. I’ve always hated sharing an anniversary with sooo many other people. On such a cheesy holiday. Don’t get me wrong, I love Valentine’s Day baking, candy, etc. but I don’t like buying into the whole “Hallmark holiday” business. Unfortch, the hubby and I couldn’t be together to do any celebrating tonight (stupid work) so my puppy love and I did some snow shoveling and cuddling in front of the fireplace, catching up on DVR.